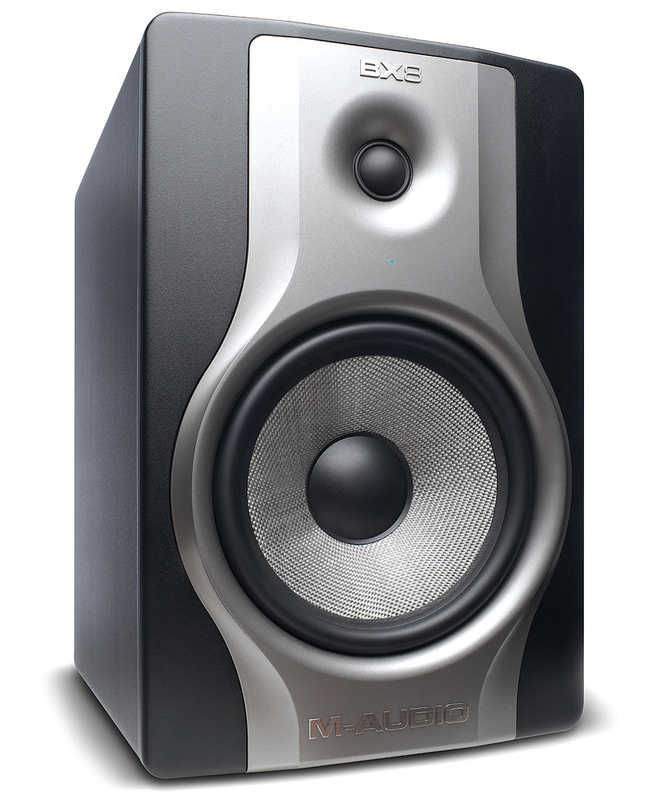 M‑Audio's existing BX series studio monitor range has just received a 'Carbon' update, which includes an internal redesign plus new external styling. The range comprises five‑, six‑ and eight‑inch models, all of which are two‑way active designs with rear porting. Class‑AB analogue amplifiers provide power to the woven Kevlar woofer and 1.25‑inch, waveguide‑loaded silk‑dome tweeter, with the two drivers crossing over at 2.2kHz. As the tweeter is mounted directly above the woofer there is no specific right- or left-hand speaker. This arrangement also makes the speakers suitable for use in surround systems. We received the six‑ and eight‑inch models for review, both of which are practical sizes for home studio use. Resilient support pads are included with all models. Taking the larger BX8 Carbon first, this has a total of 130W of power on board (60W for the tweeter, 70W for the woofer). The input can either be on a balanced XLR or a balanced quarter‑inch jack, though unbalanced operation is also supported. Shielding magnets are fitted to the woofer to reduce external magnetic fields. The BX8's quoted frequency response is 38Hz to 22kHz, while the signal‑to‑noise ratio is specified at better than 100dB(A). The power comes in on a standard IEC socket, where the operating voltage is factory set for either 115V or 230V at 50/60 Hz, though can be switched by the user if changing locations. All the expected protection features are built in, including filtering to reject RF interference, output current limiting, over-temperature protection, power‑on/off transient protection, a subsonic filter and an externally accessible mains fuse. An 'acoustic space' switch on the rear panel adjusts the low-end level to accommodate different room placements the three options being flat, ‑2dB or ‑4dB. There's no HF adjustment, and level control is by a straightforward non‑detented pot. The cabinet itself, which measures 305 x 254 x 381 mm, is made from MDF with generously rounded corners, and a black textured‑vinyl foil laminate provides a neat‑looking finish. Each speaker weighs 11.97kg. A metallic grey plastic moulding, recessed into the front baffle, provides the waveguide flare for the tweeter and is contoured to give a smooth transition between the woofer surround and the baffle. A blue LED shows that the speakers are powered on. This is mounted behind a small hole, the idea being that if you move too far off axis you can't see the LED, so you'll know when you've moved out of the sweet spot. 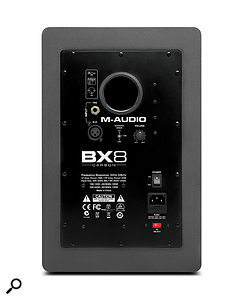 The BX Carbons can accommodate either balanced or unbalanced input signals.The BX6 Carbon is essentially a scaled-down version of the eight‑inch version, with the same power‑amp line‑up and the same 1.25‑inch tweeter, but this time paired with a six‑inch Kevlar cone woofer in a similar damped roll surround. The cabinets measure 318 x 213 x 249 mm and weigh 7.5kg each. As expected the low end isn't quite as extended as that of its larger sibling, but the speakers still manage a respectable 45Hz to 22kHz frequency response, which is more than adequate for smaller rooms. The crossover frequency is a little higher, at 2.5kHz, but the amplifier ratings are identical to those in the BX8 Carbon. Despite them being eminently affordable, I felt very comfortable working with these speakers right from the start. The eight‑inch model has more authority at the low end, as you'd expect, but there's a consistent family sound across the models, characterised by a smooth but detailed high end, warm but not too flabby lows and a tonal balance that you can have confidence in when mixing. Tapping lightly on a speaker's woofer cone gives you an indication of where the cabinet port is tuned, and here the smaller BX6 exhibits a faster decay time, which translates to a tighter, albeit less extended bass. Having the ports on the rear, rather than at the front, is a mixed blessing. On the plus side it reduces audible port noise, but on the other hand it means you have to leave some space, ideally 200mm or more, between the speakers and the walls behind them. This should only be a concern in very small studio spaces, however. I found that I could work with either monitor for long periods without fatigue, and though the '3D' quality you get with really high‑end monitors isn't quite so apparent, I felt confident that mixes done on these speakers — assuming passable room acoustics, of course — would translate well to other systems. The sweet spot is reasonably wide and there's also a good sense of stereo imaging (again, provided you have some basic acoustic treatment). For smaller home studios the BX6 (or the BX5, which we didn't get a chance to try) is probably the safer choice, though the deeper bass of the BX8 may well suit larger spaces. There's a limited choice when you are on a tight budget but still demanding a certain standard of quality. These two models from M‑Audio certainly meet those requirements, earning them a place alongside popular models from Alesis (Monitor 1 MkII A), Presonus (Eris), Tannoy (Eclipse) and Fostex (PM series) that are on my shortlist of budget speakers that still perform well. Though any lower‑cost speaker has compromises, I really can't complain about any aspect of these given their price. A good choice of monitor speaker for the budget‑conscious user. 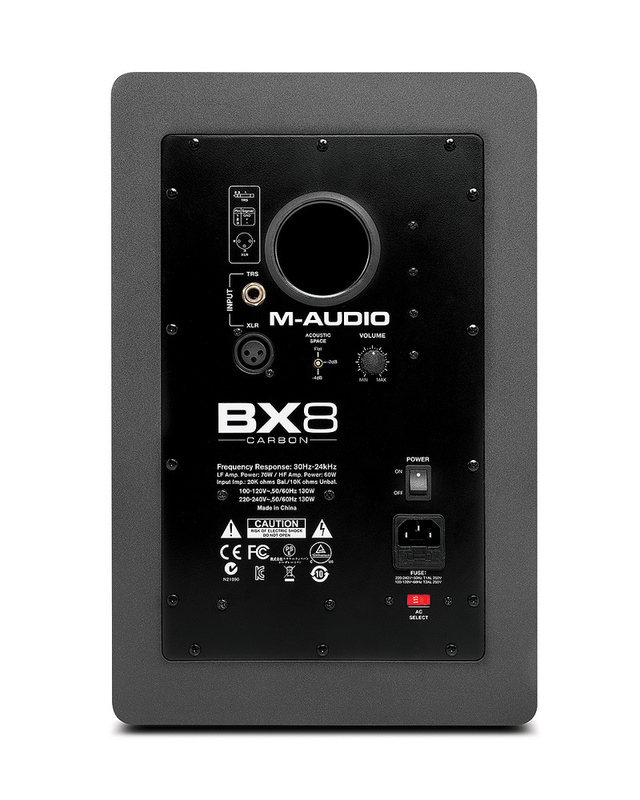 The smaller models are well suited to small studio spaces where the acoustics won't support deep bass frequencies, while the BX8 works well in slightly larger rooms. BX6 £239.98, BX8 £279.98. Prices are per pair including VAT. BX6 $399.98, BX8 $499.98. Prices are per pair.